TAOISEACH Leo Varadkar's partner Matt Barrett will accompany him to breakfast with US Vice-President Mike Pence tomorrow morning. Mr Varadkar said: "he was able to get time off work and make the journey so he'll be taking up the invitation from Mike and Karen Pence to attend tomorrow." He confirmed Mr Barrett won't be taking part in the traditional shamrock ceremony in the White House. Karen Pence won't be present as she's in the Abu Dhabi for the Special Olympics. Mr Pence has previously faced criticism for his conservative views on LGBT issues. But last year he and his wife Karen did extend an invitation for both the Taoiseach and Mr Barrett to visit his Washington home at the Naval Observatory. And unlike 2018, the event will be open to the media to attend tomorrow's event. Last year Mr Varadkar had a conversation with Mr Pence and Mrs Pence about issues of equality and LGBT rights in Ireland and America. He said afterwards that both were "very well briefed" and "knew about my personal story". "They said that both Matt and I would be very welcome to visit there in the future. It was a very nice gesture," Mr Varadkar added at the time. 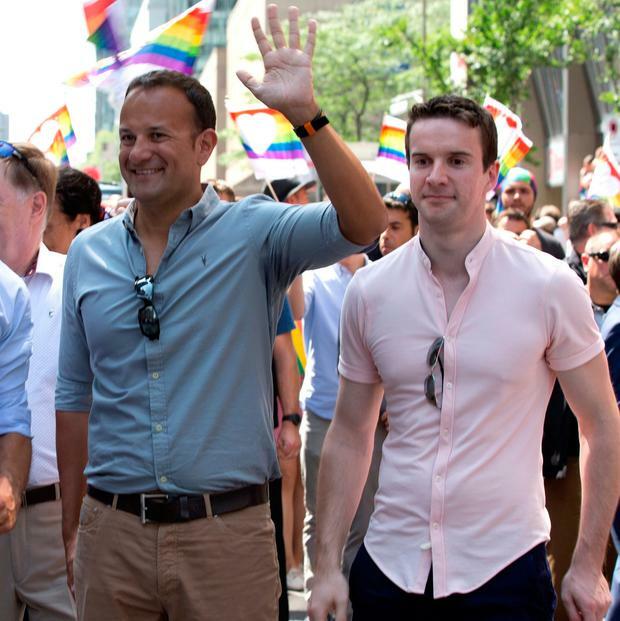 Mr Varadkar is one of very few openly gay world leaders. Mr Barrett is a cardiologist who has spent time working in the United States. Mr Varadkar has begun his St Patrick's Day promotional blitz in the United States highlighting the growing scale of Irish investment in America. He will meet US President Donald Trump in the White House tomorrow but this afternoon has a number of engagements with business figures from both sides of the Atlantic. Brexit and its impact on Ireland will be high on the agenda at all of Mr Varadkar's meetings in the coming days. Mr Varadkar has arrived at the US Chamber of Commerce headquarters for meetings and a 'fire-side chat' with Chamber president and chief executive Thomas Donohue. The event is entitled 'Ireland, Gateway of the Atlantic'. Mr Varadkar has highlighted how Irish investment in the United States is "at an all-time high". He said: "The scale and diversity of this investment is indicative of the strength of the partnership between our two countries." Enterprise Ireland has said there's more than 100,000 people employed by Irish companies in the United States. US companies employ around 155,000 in Ireland. Mr Varadkar is hosting a business development round-table with leading Irish companies that plan to invest in the US. Companies include security firm Netwatch Group, healthcare company RelateCare and IT company Wisetek. When he arrived Mr Varadkar Tweeted: "Here in Washington DC and starting a busy week by meeting some friends from home: the Dublin and Belfast Chambers of Commerce." Later this evening he is to attend the American Ireland Funds dinner. Explainer: What happens next with Brexit?